Roofing is one of the most important features on a residential property. In order for the members of your household to be secure and comfortable, you must have a roof with the strength and durability to withstand the outside elements and any harsh weather conditions throughout the course of a given year. When it comes to the strength of your roof, the material is crucial, because this will determine whether your roof will be strong enough to last throughout the span of time that you own the property. If and when you do sell your house, it's best to have a roof that's every bit as sturdy as the day you first moved in, because this will make it much easier to turn the house around on the resale market. Therefore, it's beneficial to have roofing that consists of hard, natural wood like cedar, which has the strength to withstand temperature challenges all year round. With a steam bent shingle roof, the security, comfort and appeal of your home are likely to last indefinitely. Enter your roof's information to the right to receive pricing on custom steam bent wood shingles. What Are Steam Bent Wood Shingles? Steam bent wood shingles form the basis of a unique style of roofing made of cedar wood culled from trees native to the Pacific Northwest. Due to the steam bending process and wave coursing we we employ for this style, each roof is uniquely its own. The curved edges and undulating courses give off a somewhat unorthodox appearance and hand–made charm that’s all its own. On homes of all sizes, steam bent cedar shingles generally serve as the visual focal point. Roofs of this type are often laid out in ways that emphasize the curvature of the shingles. On some homes, for example, rounded cedar shingles hang over the roofs and even cover the upper edges of bedroom and living room windows. As such, steam bent shingles have a novelty appeal that has made houses with the roofing style popular on social media. The steam bent cedar shingle roof system is popular for a number of reasons. For starters, bent shingles give each home a unique vintage appeal that can set a property apart from surrounding homes. Thanks to the natural quality of the wood itself, roofs of this type have a timeless charm that never goes out of style. In 50 years, these homes are likely to be just as popular as they are today, if not more so. Thanks to the strength of the wood from which they're made, cedar shingles have a durability that's second to no other roofing type. This, in turn, can lead to increased property value for any house that bears roofing made of cedar. As one of the most unique styles of roofing in existence, steam bent shingles are a perfect way to reap the benefits of strength, novelty and timelessness all in one. Here are a few of those advantages. Cedar is a high-quality, appealing and abundant species, and are the perfect choice for your new roof. Throughout the span of your occupancy of the house in question, a set of curved cedar shingles could easily go without any need for repair. Regardless of changes in climate and progressively harsher weather patterns, these shingles have a proven power to withstand the elements of any habitable environment. In the event that repairs do become necessary, the work involved is generally minor. On the majority of homes with cedar shingles, maintenance consists of little more than gutter drainage and overhead branch trimming. Therefore, the most you'll likely ever need to do with a steam bent shingle roof is pull out a ladder to check and possibly drain the gutter, and perhaps trim the branches of trees that stand adjacent to your property. It is recommended that you have the roof be cleaned with biodegradable cleaner, using a low pressure sprayer. This can be left on the roof for the rain to wash off. Branches of nearby trees need to be trimmed in order to prevent overhang above the rooftop. Otherwise, branches could fall off onto the roof and cause damage. Drains also need to be inspected biannually to ensure the proper flow of water from off the rooftop. 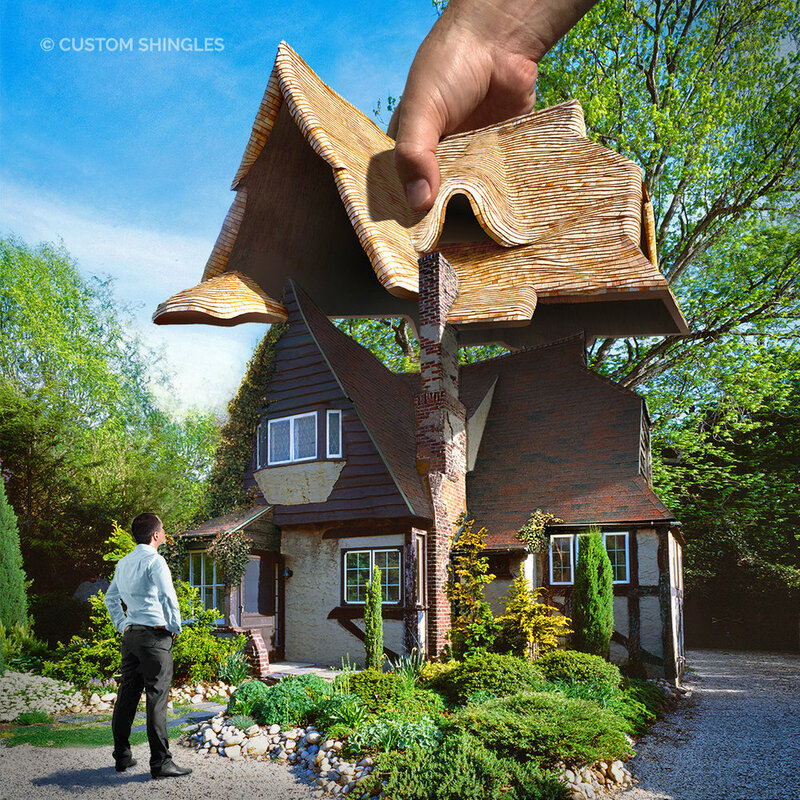 Curved cedar shingles provide homes with a unique look that resembles something from out of a fairytale. With the alternating curves of each row of shingles, the style is evocative of old European village homes. Cedar shingles also make creative use of a natural resource, which gives this type of roofing an ageless appeal that transcends the often fickle nature of housing trends. As an alternative to ordinary roofing styles, the steam bent cedar shingle roof system is one of the most individualistic of roofing options. On conventional shingle roofs, each shingle is uniform in shape, size and cut, whereas with steam bent cedar shingles, each shingle has a slightly different shape, bend and dimension. The result is a uniquely off–kilter appearance that adds an animated touch to homes of all ages and designs. You may customize wood shingles in any given number of ways. Due to the applicability of this roofing type, steam bent cedar shingles can be applied to old and new homes alike. On older homes, steam bent wood shingles can reignite the comfort of the interior, as well as the visual appeal of the overall facade. Due to the slightly avant-garde look of steam bent shingles, the style is also suited to modern homes. A house with a futuristic design, for example, could have bent shingles applied to emphasize the overall far-out aesthetic of the property. Regardless of the layout of a house, cedar shingles can be fitted to virtually any type of roof, even when there are multiple angles to work around. In addition to giving your home a more timeless quality that will last the ages, round roof shingles can set your house apart in the eyes of prospective homebuyers. As such, a steam bent shingle roof can make your home look more attractive on the resale market. A house that might hold little appeal on the resale market could suddenly sell for big bucks once fitted with a set of rounded cedar shingles. If your house is located on a street where most of the adjacent properties are uniform in appearance, the addition of steam bent shingles can make your house the envy of all your neighbors. Likewise, an isolated home in a woodsy area can also be rendered more distinctive with the addition of cedar shingles. What Is the Steam Bending Process Like? When people ask about how to shingle a round roof, they're often confused by the process that goes into making the wood appear as it does within a steam bent cedar shingle roof system. Fact is, strange yet visually appealing things can be done with wood when certain processes are employed. One such process is steaming, which can impact the shape and overall appearance of a set of shingles. Most of the bending for our project takes place in our warehouse headquarters. In some cases though, we will ship our mobile bending unit onsite, and the whole process is conducted at the site of the roofing installation. What Do Steam Bent Shingles Cost? A cedar shingle roof is more expensive than the application of an asphalt roof, but the benefits of cedar shingles pay back in spades over the course of a residential occupancy. Whereas asphalt shingles can buckle under the elements, cedar shingles have the strength to withstand the hottest of summers and the coldest, harshest winters. A set of asphalt shingles could easily give out in spots and ultimately need to be replaced within two decades, whereas cedar shingles will often remain in perfect condition for decades on end with just the occasional need for maintenance. In fact, the cost in repairs that an asphalt roof might require within just a few short years could easily exceed the difference in cost between a plain asphalt roof and a unique, beautiful, timeless roof made of cedar wood shingles. Since 1982, we have led the way in the design of steam bent cedar shingle roofs for houses new and old. 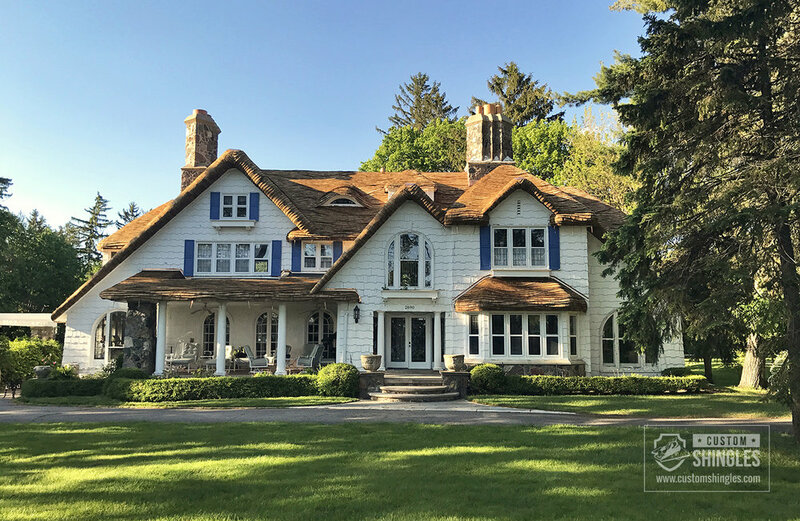 On houses built earlier in the 20th century with rounded roof shingles, our work has restored the original charm and character of the houses in question. Likewise, the shingles we provide have transformed homes built within the last 50 years. As such, we've been responsible for bringing the style into the new millennium. As an increasing number of homeowners discover the unique characteristics of rounded cedar shingles, the style continues to grow in popularity. For homes that are modern in terms of architectural design, we've developed a framing system that makes it easy for installers to apply this roofing style on houses far different from the vintage homes that first featured the style a century ago. Here are a few reasons Custom Shingles offers the best value for your steam bent wood shingle roofing project. 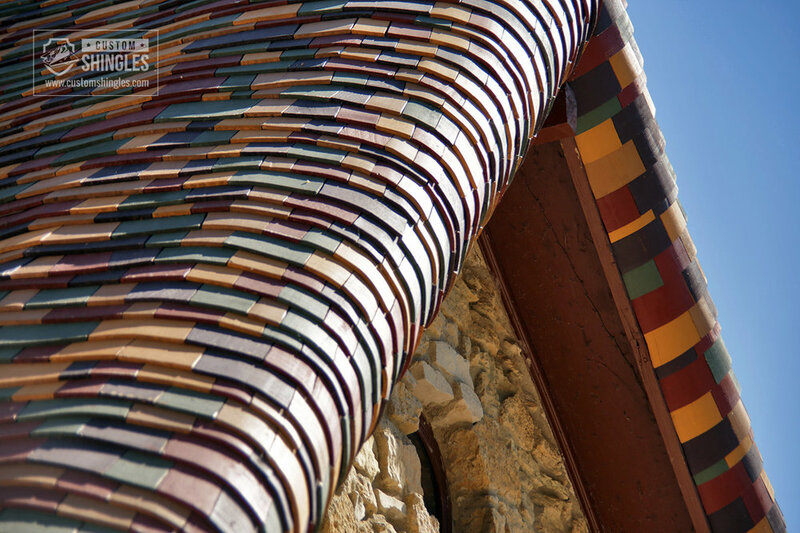 The prototype for curved shingles was cultivated in Europe long before Columbus first landed in the Western Hemisphere. In the medieval countryside villages of the Old World, hand-cut shingles provided cottages with a natural look that blended in well with the landscape. In the early 20th century, American roofers began to use steam bent shingles as an alternative to the more conventional roofing styles of the time. This growing trend, which coincided with a newfound stateside popularity of vintage European design styles, was made all the more possible by the availability of cedar — a timber native to the U.S. northwest. In 1982, we invented and constructed our own steaming and bending equipment. We’ve been refining our process and improving our product ever since then – which means we’re the premier provider of custom bent wood shingles today. 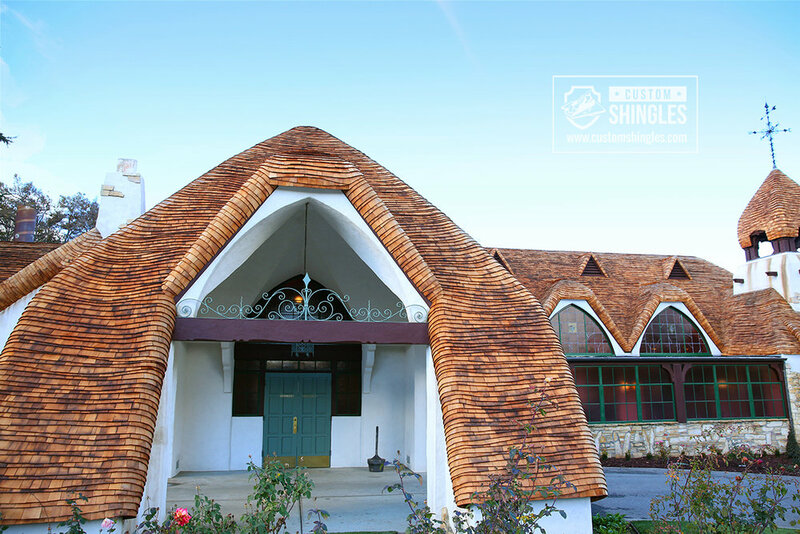 Rounded wood shingles are carefully made to withstand the tests of time and the elements. When you buy a new roof for your home, you deserve to have that roof last for as long as you remain at the property and even beyond that timeframe, so you can then sell the home without any need for last-minute roof replacements. Throughout the span of your occupancy, any maintenance that might be necessary should not consist of anything more than basic upkeep, the likes of which could be handled by any homeowner. With curved cedar shingles manufactured by Custom Shingles, your roof will likely be in better condition for a longer span of time than all the neighboring homes in your area that make do with more conventional roofing styles. Unlike some of the more conventional roofing styles on today's market, cedar shingles apply to the personal styles of individual homeowners. Newly built homes are often topped with unassuming roofs that add little in terms of character to an overall property. Steam bent cedar shingles, on the other hand, can make a home stand out to motorists and passersby. Of course, it's important with any roofing application to have the skills required for such an undertaking or to hire a team of professional roofers to carry out the job to perfection. Either way, at Custom Shingles, we design steam bent cedar shingle roofs that can be applied to virtually any type of home. Whether you intend to live at your current residence for seven years or two decades, the installation of rounded cedar shingles could be the most significant investment you'll ever make in a property. Rounded wood shingles can be customized to the unique needs of a given property. If you have a small, simple home, cedar shingles can be arranged to give your house the humble, homey feel best suited to a smaller property. If your house is larger and more complex in its layout, rounded roof shingles can be applied in a way that accommodates any given number of angles or levels that might be involved. As weather patterns grow more intense and the housing market becomes increasingly competitive, it's more important than ever for a home to have features that can make your home stand out and boost property value. At Custom Shingles, we offer rounded roof shingles that provide houses with the utmost in comfort and visual appeal. To learn more about what we offer, contact us today.